Office buildings added 2.5 million square feet ... of occupied space in the fourth quarter, compared with a loss of 14 million square feet a year earlier, Reis said in its report. It was the first rise in net absorption since the fourth quarter of 2007. 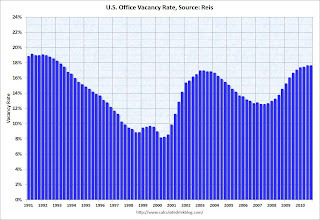 Reis is reporting the vacancy rate was at 17.6% in Q4 2010, the same as in Q3 and up from 17.0% in Q4 2009. Reis should release the Mall and Apartment vacancy rates over the next few days.